Start Building Your Arks! Major Rain Is Coming to NorCal. 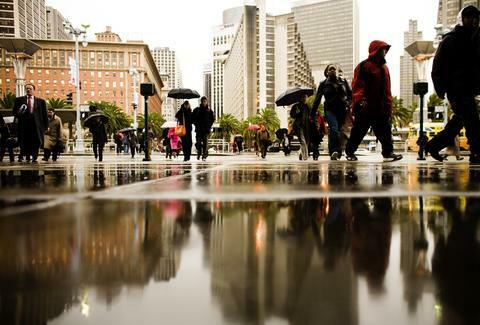 As you probably know, San Francisco recorded no rain in January for the first time EVER (okay, in the past 165 years, basically the same thing). Yeah, this drought we're in is no joke, but the good news is that there is a river in the sky and it's about to unload on us, dumping what meteorologists are saying could be up to 10in or more of rain on NW California starting Thursday and lasting through early Sunday. Okay, fine. The river is not technically a river; rather, it's an atmospheric river, meaning "a long, narrow plume piping deep moisture from the tropics into the mid-latitudes", which apparently ​can transport, as water vapor, up to 15 times the average flow of liquid water at the mouth of the Mississippi River. Whatever kind of river it is, we'll take it. The bad news is that forecasters are still up in the air about whether or not this storm will bring much-needed snow to Tahoe, where the current snowpack is currently only at 25% of the average for this time of year. OpenSnow, the weather bible for anyone who skis, says it's still too early to tell. Literally, the models are showing Tahoe snow levels will be anywhere between 6,500 and 10,000ft, which is the most useless estimation of all time. If it drops down to 6,500ft, we're totally stoked. If it stays anywhere above 8,750ft, completely bummed, and you can say bye-bye to any of the little snow that remains. Anyway, what does this mean for everyone in San Francisco? It looks like at least a few inches of rain, which means you'd better bust out your galoshes and umbrellas, and be very prepared to pay major surge pricing for your Uber. The bad news? It'll all be over by Monday when the high-pressure system returns. Still, for now, it's something to be happy about. AND a good reason to blow everyone off this weekend, order in Thai food, and do some serious Netflix binge-watching. Daisy Barringer is Thrillist's SF Editor and all she and her Saint Bernard want in life is for it to dump snow in Tahoe. Follow her on Twitter and #PrayForSnow @daisy.